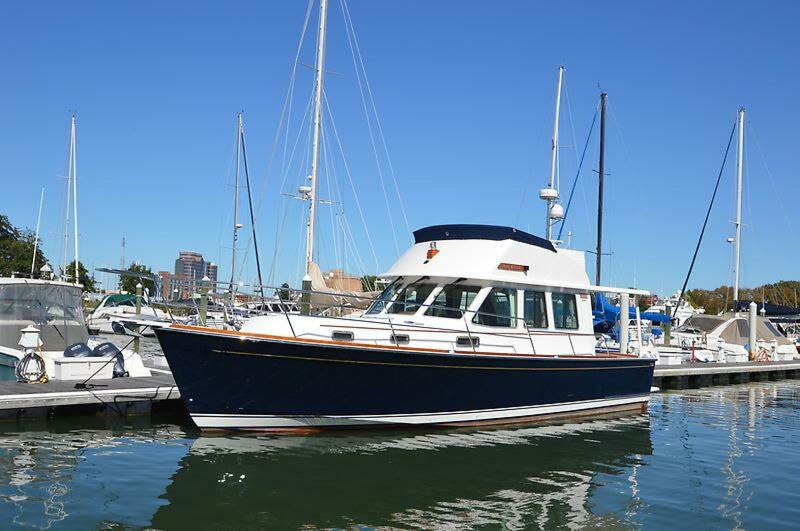 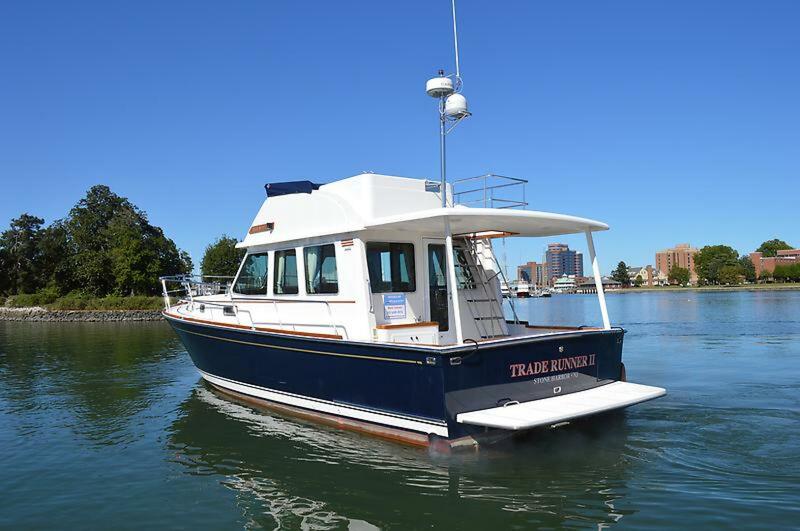 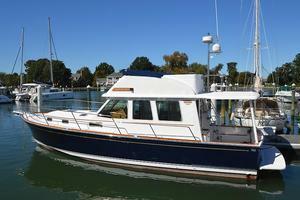 "Trade Runner II" is an excellent example of the much sought-after Sabre 42' FB Sedan. 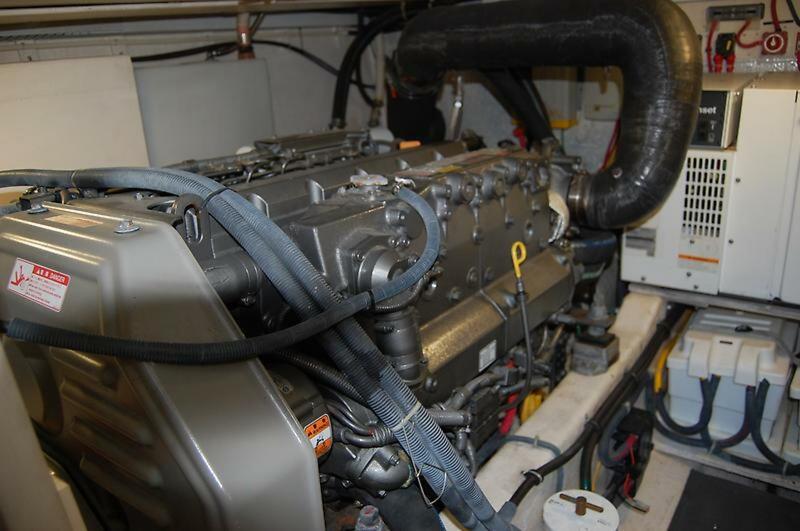 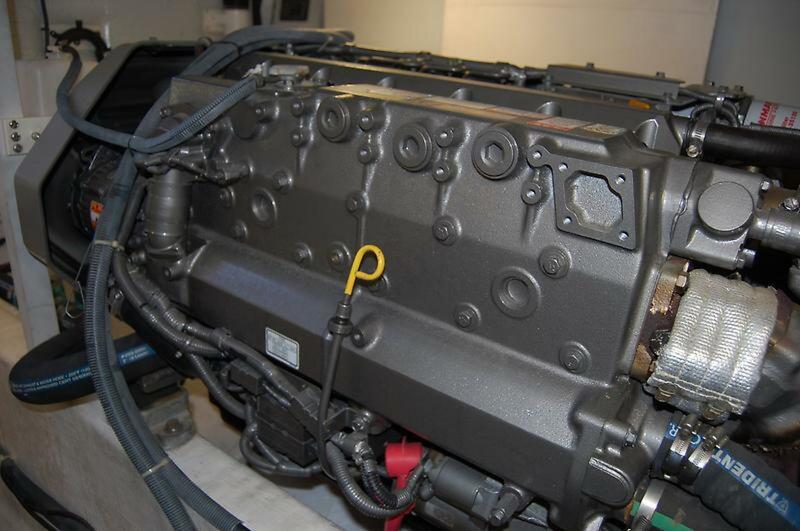 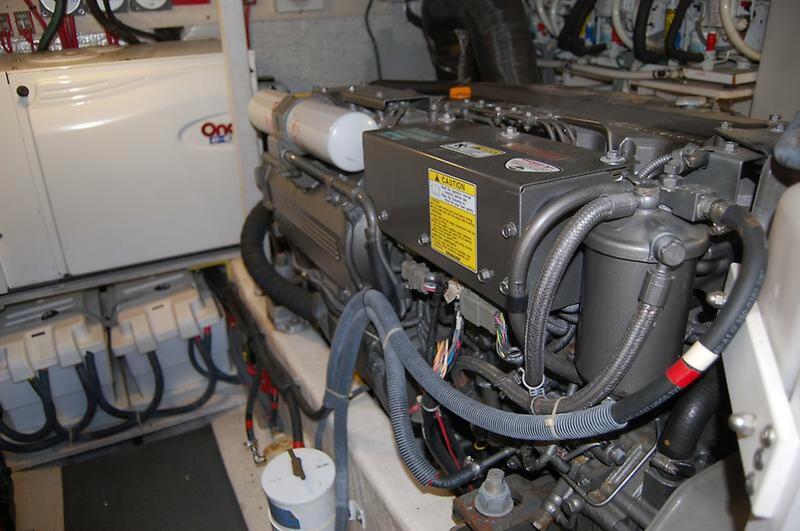 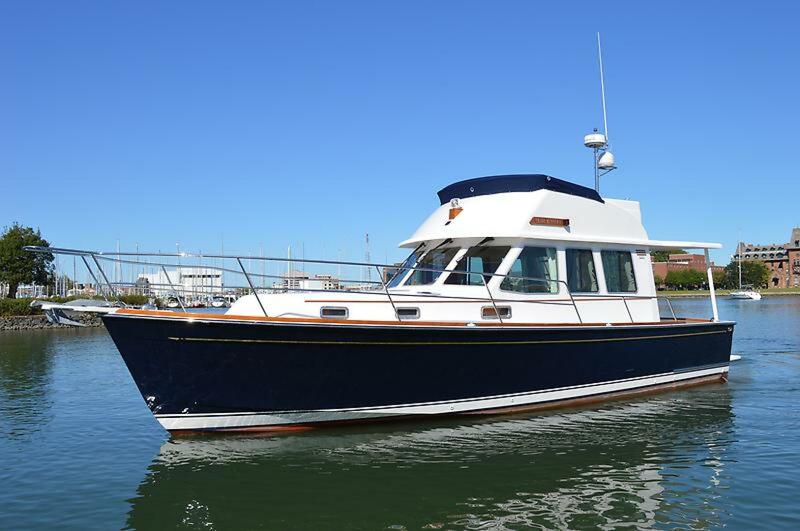 Powered by a pair of Yanmar 6LY3-ETP 480 hp diesels with only 800 hours, this fine yacht will cruise an easy 25-26 knots in most sea conditions. 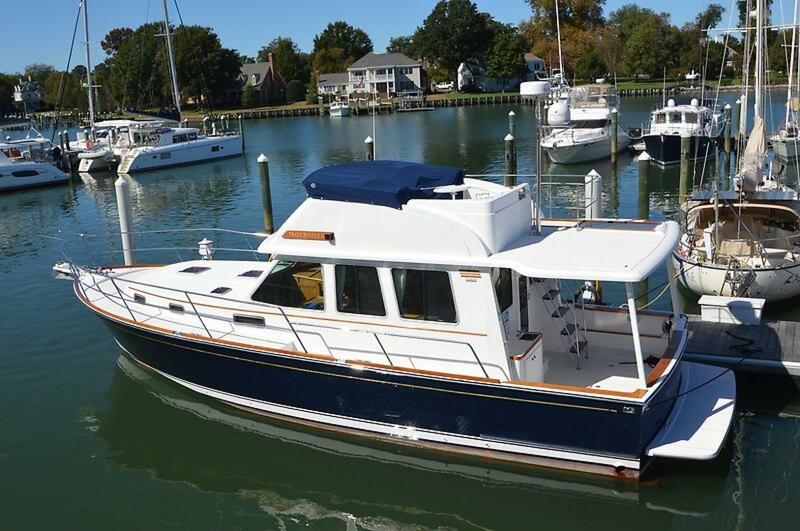 Her deep-v hull (Awlgripped in 2016!!) offers a very soft ride in a chop and tracks very well in a following sea. 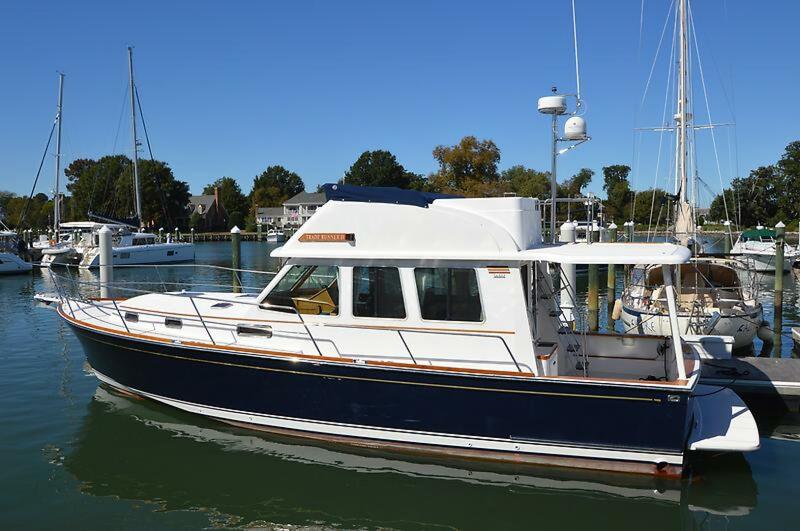 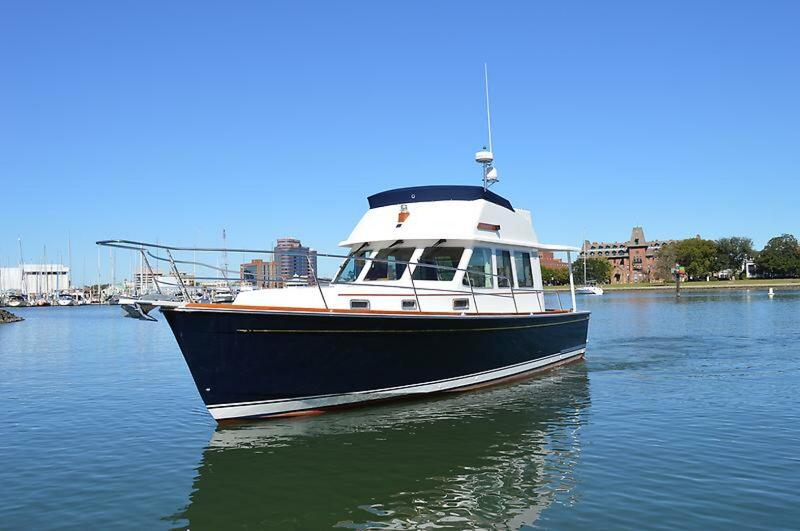 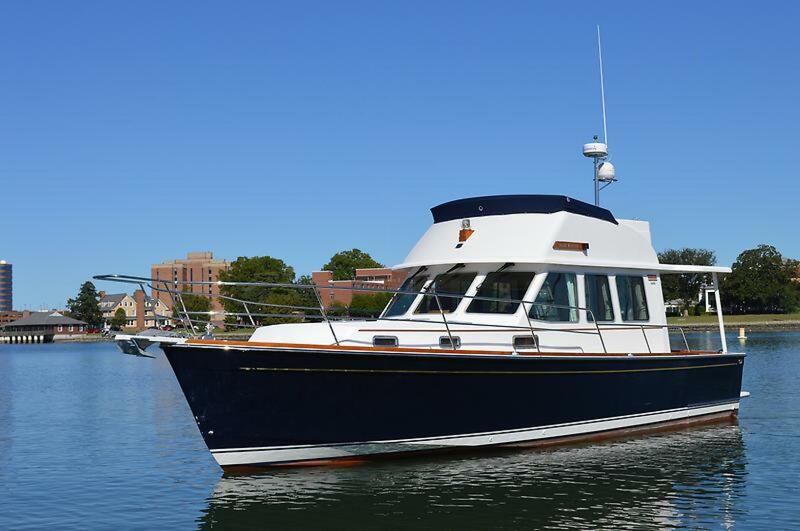 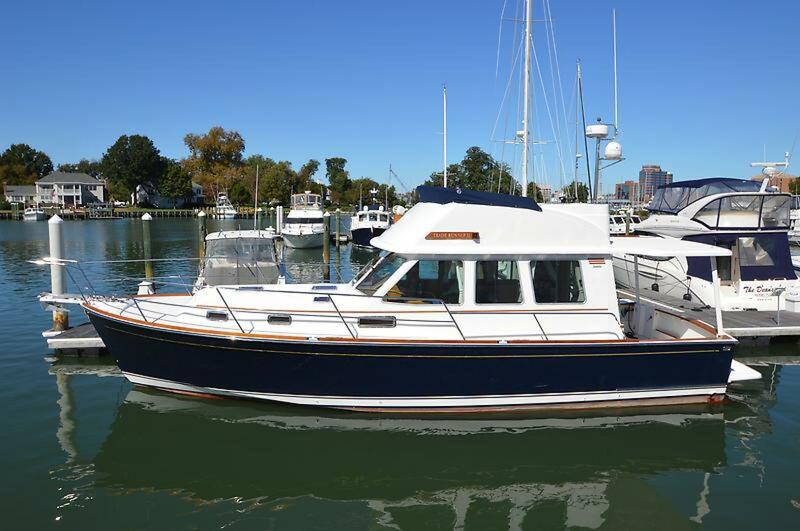 Bought new by her current (sole) owner in 2009, she is well-equipped with side power bow thruster, Garmin electronics package (both stations), SAT TV system, BOSE entertainment system (including two JENSEN flat-screen TVs), and much more. 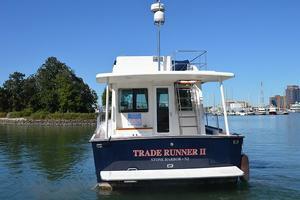 "Trade Runner II" is a lovely, traditional, downeast vessel built with pride in the Maine tradition. She is a very rare find in that she has a much more spacious interior than her sister 42' Expresses, with most of the extra space being found in the rather large salon. 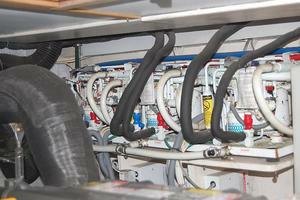 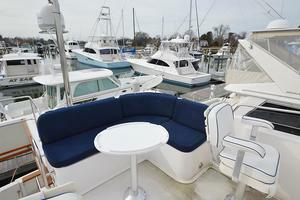 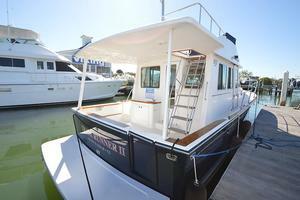 Plus, she offers the versatility of the flybridge. 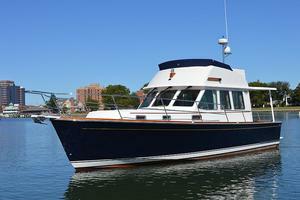 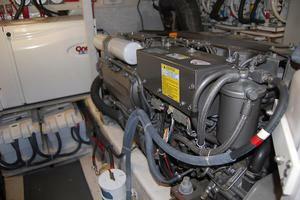 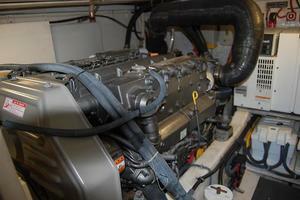 She is fast, elegant, quiet, and efficient to operate- not to mention an incredible sea-boat! She has just enough exterior teak to turn heads, but not so much to be a maintenance nightmare. 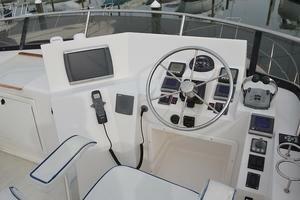 "Fast Cruising" at its finest! 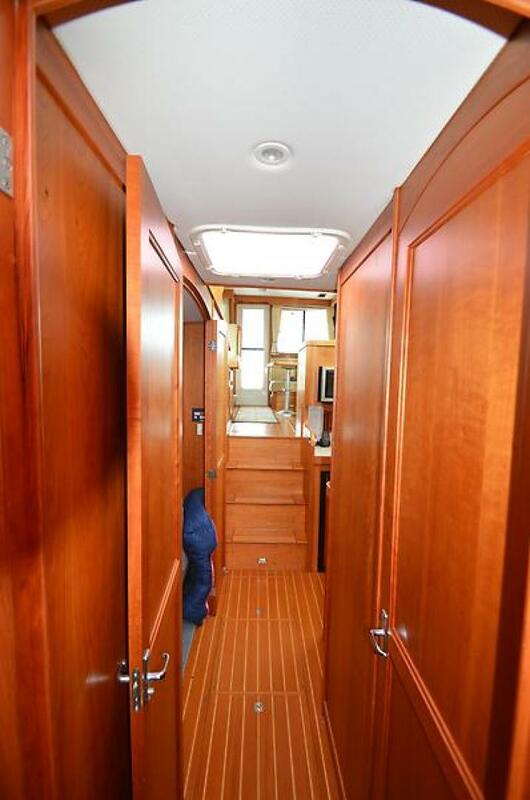 Serious Seller will consider all reasonable offers- call listing agent to discuss details. 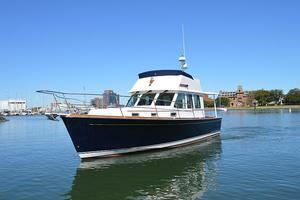 VERY nice boat!! 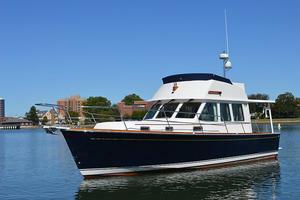 This one is not to be missed! **Just significantly reduced as an allowance for a hard-top or bimini top. 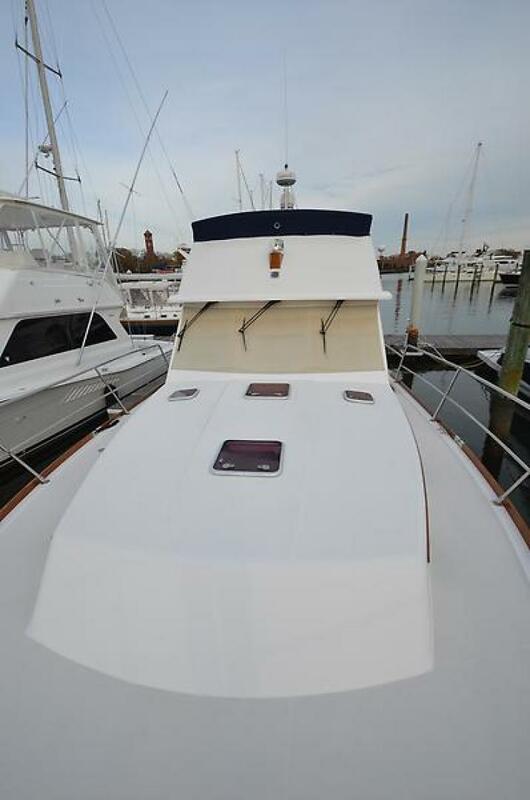 Just hauled, bottom cleaned, props cleaned, all exterior zincs replaced. 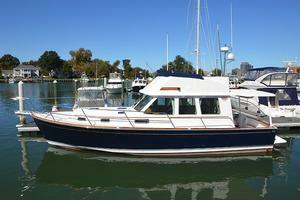 She is ready for the season! 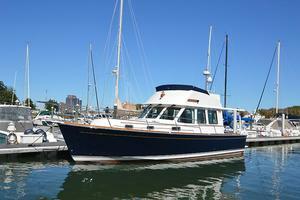 The Sabre 42 FB Sedan was designed as a long term cruising yacht for a couple with occasional guests. 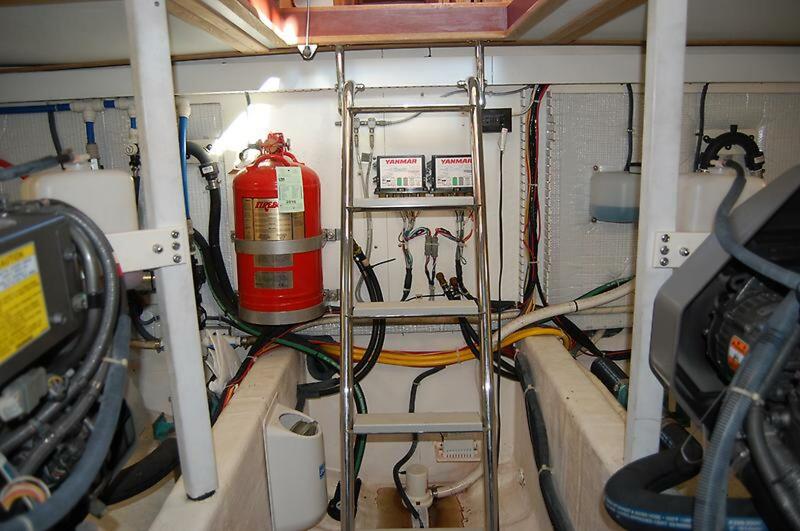 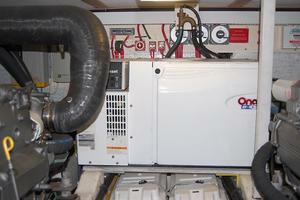 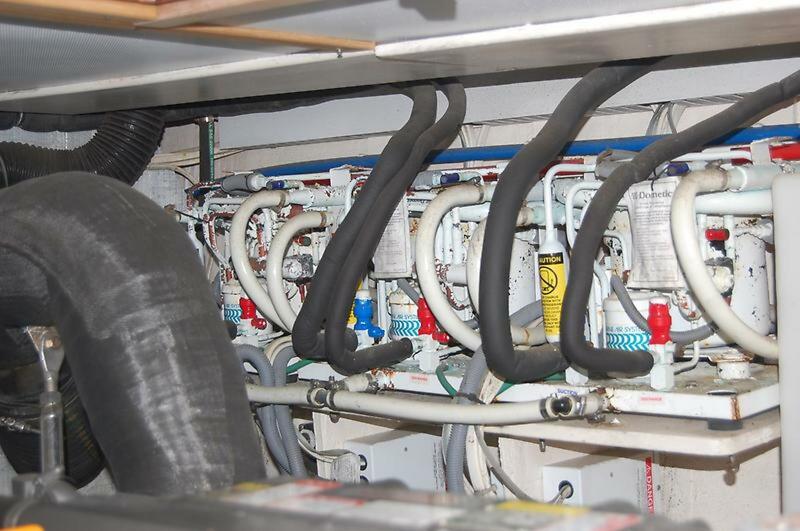 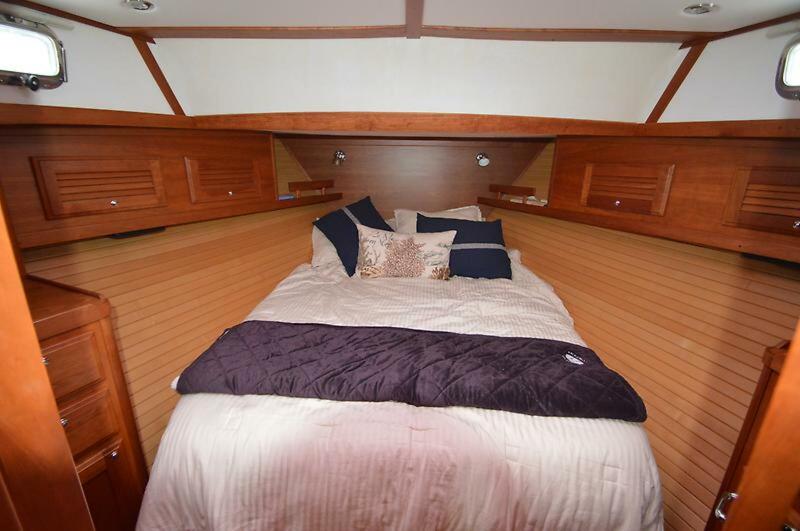 Starting forward and aft of the chain locker; Her berth has a luxurious queen sized mattress, and there is plenty of storage below the berth that has a hinged top with gas struts. Outboard and above her traditional hull ceilings are found enclosed lockers and convenient shelves for books and other storage, as well as a cedar lined hanging locker to keep clothing crisp and neat. 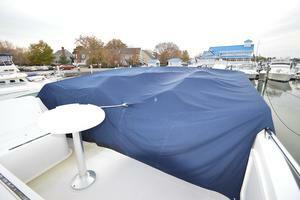 A large Skyscreen hatch overhead has a screen and a sun shade to block out unwanted light. Next aft to starboard is a comfortable guest cabin with a settee that can convert to a double berth. 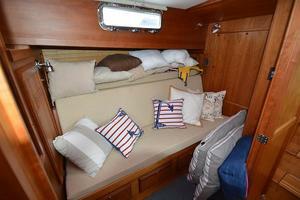 Cabinets and shelves are outboard as well as having storage under the settee. 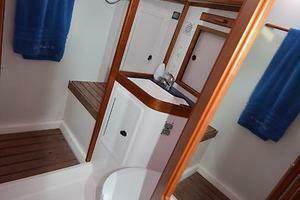 A hanging locker and opening ports offer further comfort for guests. 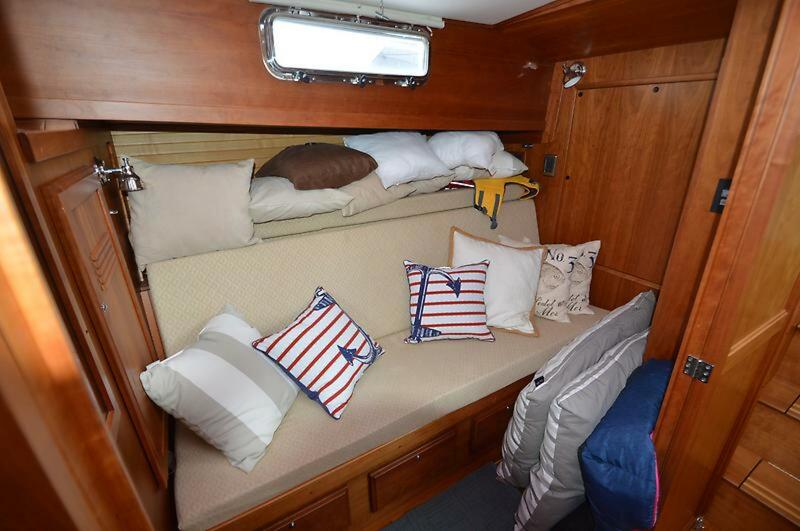 Her privacy doors open double wide to allow an open concept across from the galley, especially when the berth has been converted back into "sofa mode". 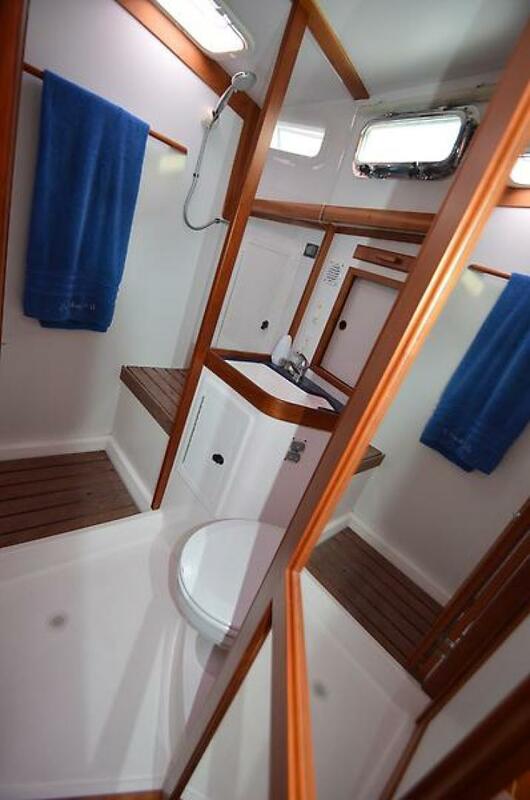 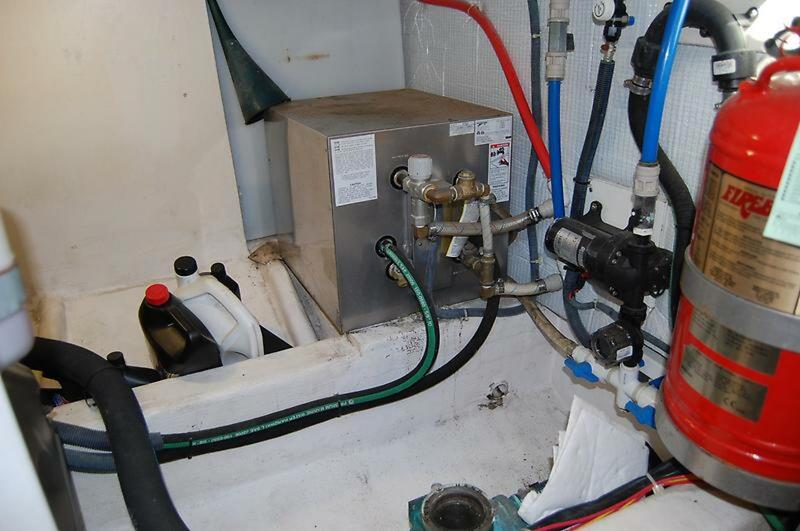 To port is her large head with vanity and corian counter top, electric marine toilet with holding tank and a separate shower stall with teak grate and seat. 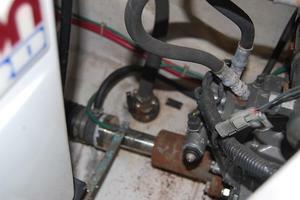 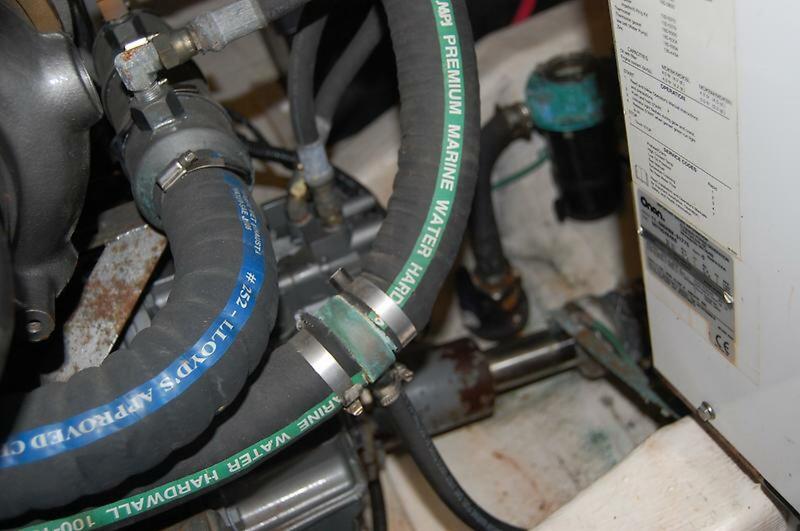 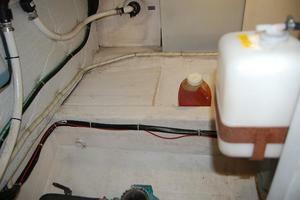 Here too one will find storage under the sink as well as outboard. 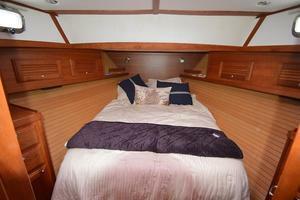 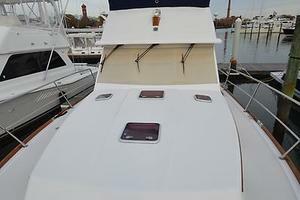 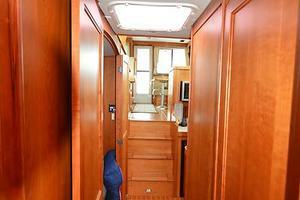 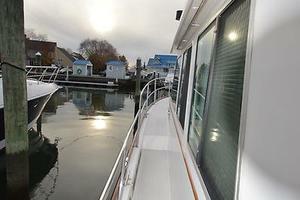 The head is quite roomy for a 42' and is more than adequate to be shared by owners and guests for the weekend. 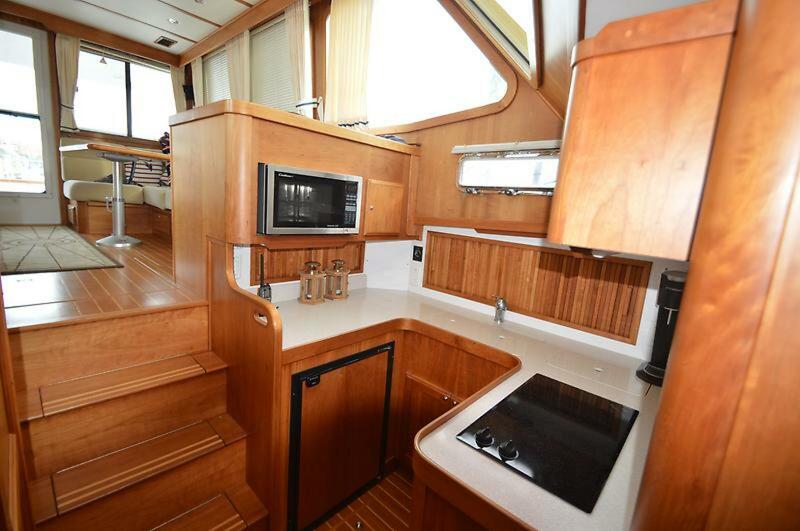 Next aft to port is the U-shaped Sea Galley; She is well equipped and has a custom extended cabinet over the stove, lovely corian counters and all the room and tools for preparing gourmet meals. 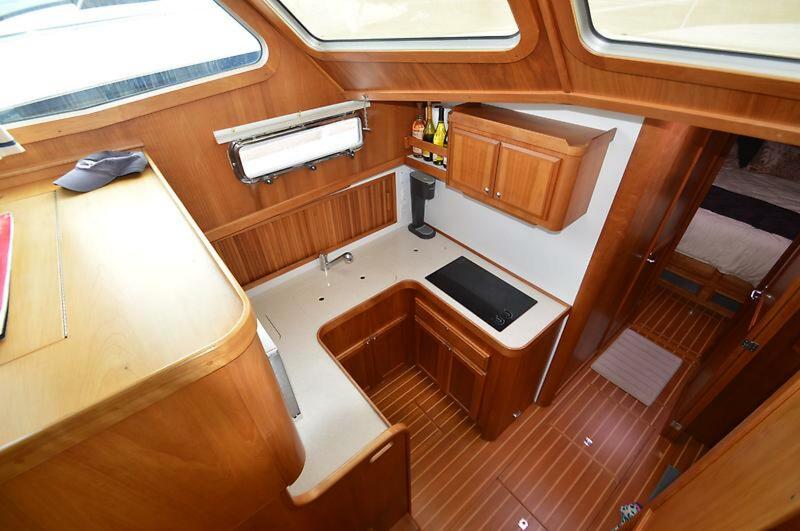 Down 3 steps from the salon, the galley has an open concept and one can easily commune with guests while preparing meals and snacks. 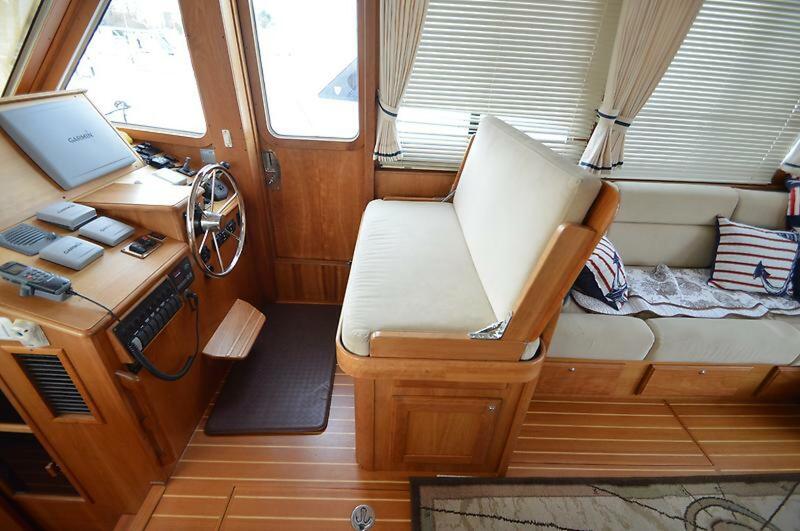 Up three steps to the Main Salon where one will find the helm to starboard with bench-style helm seat and side door for easy access to the deck. 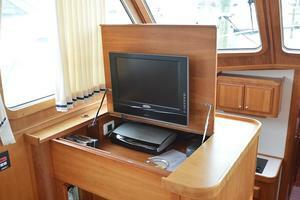 To port is the navigation station, which cleverly houses the Jenseh flat-screen TV and Bose sound system. 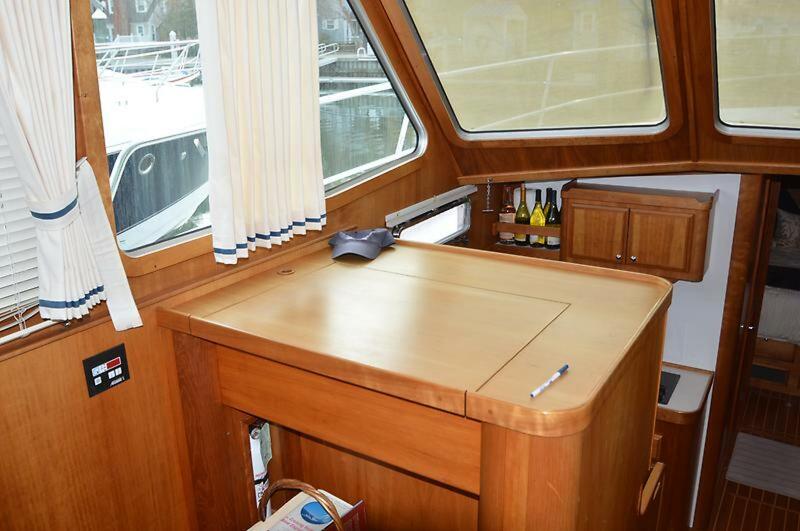 Aft of the Nav station is the L-shaped dinette with custom high-low salon table. 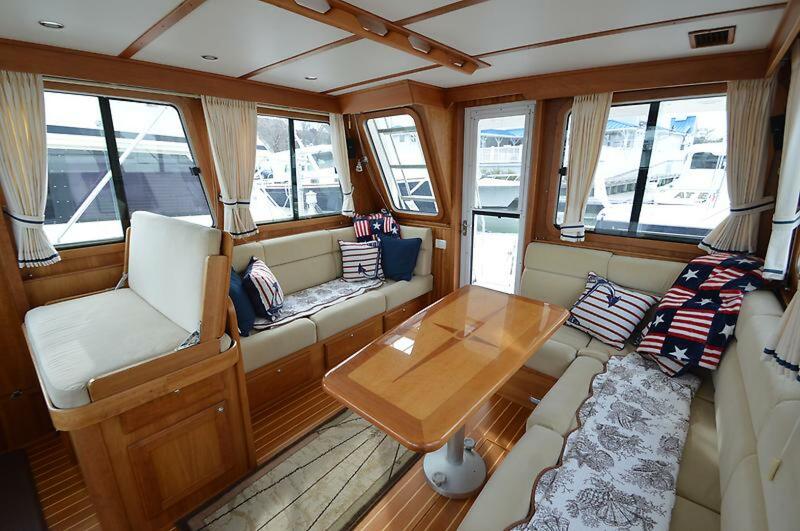 Opposite the dinette to starboard is a second settee- this arrangement offers more salon seating than the majority of her sisterships, most of which offer a barrel chair and entertainment center in lieu of the additional seating. 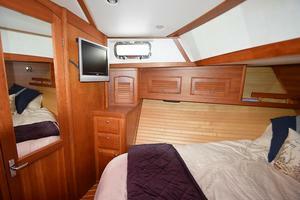 She has Accord shades for all the ports as well as the large windows in the main salon. 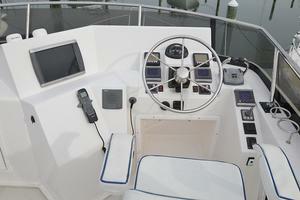 Exterior windshield covers give privacy to the forward windows. 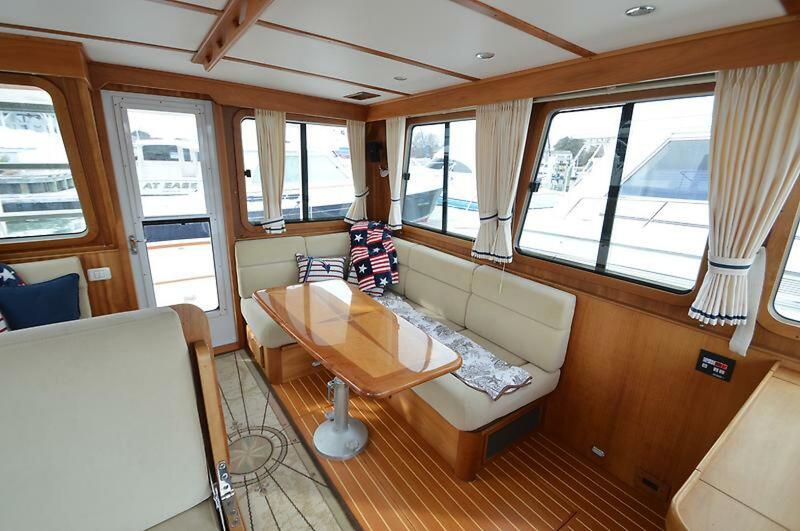 The Sabre 42 Sedan offers great views of her surroundings whether underway or at rest thanks to her large framed windows. 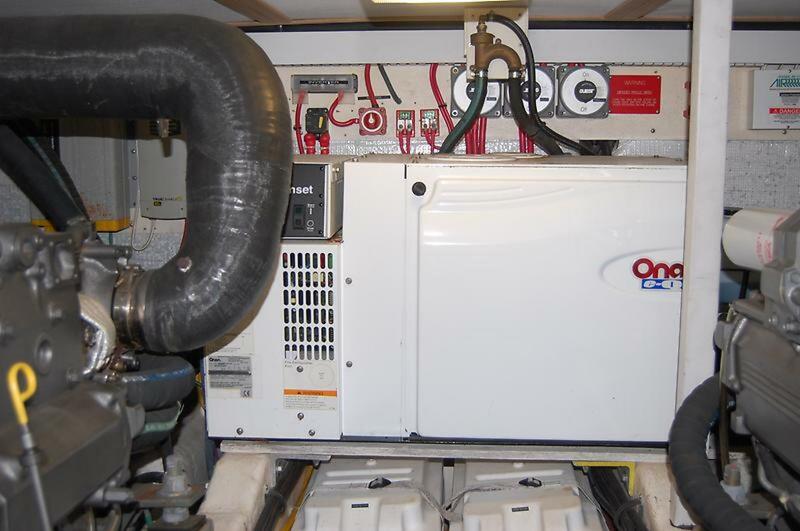 Air conditioning and heating systems are standard while opening hatches and windows offer an abundance of ventilation when the weather is fair. 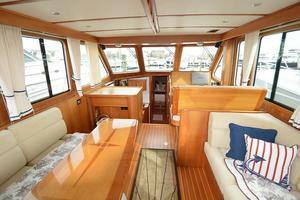 Her interior has lovely cherry cabinetry as well as teak and holly sole that give warmth to her bright interior. 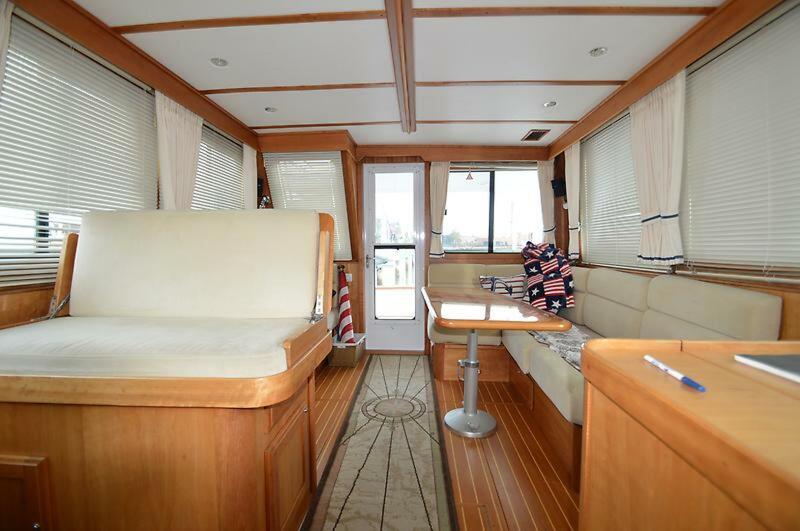 The salon is an extraordinary space in which to spend time aboard enjoying your favorite cruising destinations. 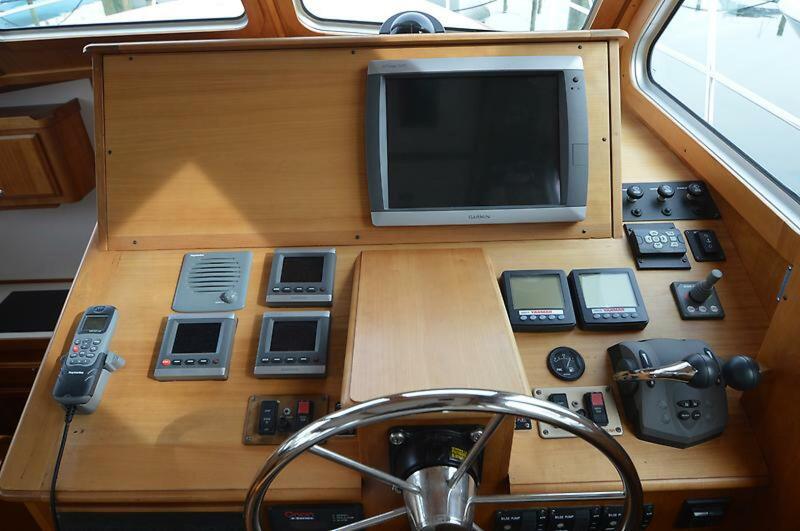 Leaving the salon aft one enters the aft cockpit. She has a good size wet bar to port with corian counter, sink with hot and cold pressure water and a tremendous amount of storage beneath. Three large hatches provide additional storage for deck chairs, deck table, fenders, additional dock lines or what ever you need. 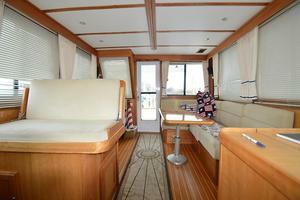 Port and starboard steps lead to the wonderfully wide side decks for ease in moving forward. 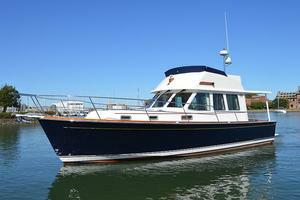 She is equipped with heavy duty stainless steel side rails for safety. 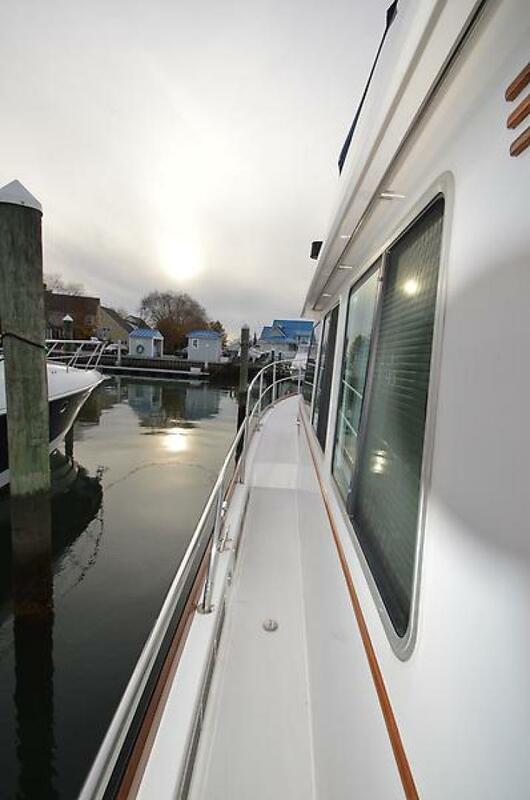 The flybridge is accessed via an angled ladder with wide steps from the cockpit. "Trade Runner II" is rare in that the flybridge deck extends back over the cockpit to provide shade and more room to store water toys. The helm console is forward with two pedestal-style seats for the captain and companion. 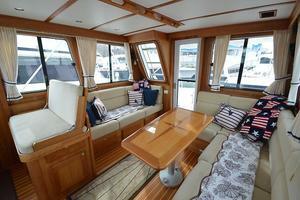 Aft is an "L-shaped" settee with cocktail table. A custom canvas cover protects the helm and helm seats when not in use. 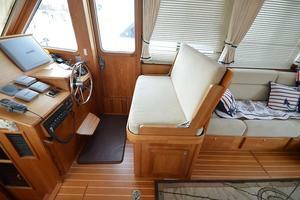 With the Sabre 42 Sedan's galley-down layout, the working areas are well lit by the large windshield overhead and stainless steel opening portlight. This open and airy galley arrangement allows the helmsperson to be in contact with someone in the galley. 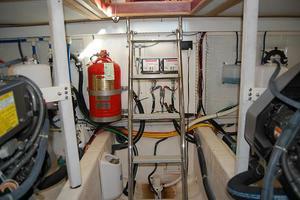 This well equipped galley has an abundance of storage as well as counter space for food preparation. The galley is equipped with abundant drawer and cabinet storage, and has a very open feel.